After a week that saw the Maryland Terrapins men’s soccer team tie Seton Hall 0-0 and beat Virginia Tech 2-0, Maryland dropped from No. 1 in the rankings to No. 3, behind UConn and Creighton, respectively. Once they defeated Charlotte last Tuesday by a score of 3-1, the Terps prepared to host the No. 2 Blue Jays at Ludwig Field. Coming into the game, not only was Creighton undefeated with a record of 8-0-0, but the Blue Jays had also not even been scored upon. The Terps made quick work to change that behind possibly the top forward in the nation. Casey Townsend (11) scored in the 14th minute in what ultimately proved to be the game-winner. Maryland’s defensive backline was stellar, holding Creighton without a shot until the 48th minute and posting their sixth shutout of the season. Rutgers comes into tonight 1-3-1 in their last five matches. The No. 2 Terrapins are the third ranked team the Scarlet Knights will face this year. Rutgers dropped a 1-0 game on September 16 to No. 25 Iona and lost 2-0 to No. 9 Indiana two days later. Rutgers has scored as many goals (15) as the team as given up this year. Kene Eze (five goals) and Juan Pablo Correa (four goals) lead the Scarlet Knights in scoring. Tonight’s game will be the fourth meeting all-time between Maryland and Rutgers. The Terrapins hold a 2-1 series advantage. The Terps are coming off a week in which they defeated two ranked opponents in No. 12 Charlotte and No. 2 Creighton. Maryland has outscored its opponents by a 29-7 margin this year. Casey Townsend (22 points) leads the Terps with 11 goals. John Stertzer (17 points) has scored seven times while Patrick Mullins (12 points) is third on the team with five goals. The seven goals the Terrapins have given up are the fewest of any ACC team. They are allowing just 0.64 goals per game and have surrendered only 29 shots on goal all season. Maryland has outshot their opponents 193-85 this season. This is Maryland’s eighth home game of the season. 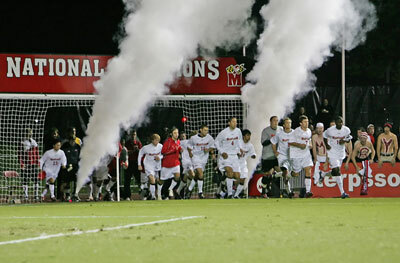 The Terps are averaging 4,537 fans per game at Ludwig Field in 2011. You can listen to the action live on WMUC Sports at 7:20. Josh Fendrick and Pauly Kwestel will be on the call. This entry was posted on October 4, 2011 by Scott Kornberg. It was filed under Maryland Terrapins, Soccer and was tagged with Casey Townsend, Maryland men's soccer, Maryland soccer, Maryland Terps, Maryland Terps men's soccer, Maryland Terps soccer, Maryland Terrapins, Maryland Terrapins men's soccer, Maryland Terrapins soccer, Scott Kornberg, Terps men's soccer, Terps soccer, Will Swaim.